Darth Sunshine: Balloons! And BLOG CANDY!!!!! I made a card for the Mini Virtual Stamp Night over on Splitcoaststampers last weekend and LOVED the challenge that said USE BRIGHT COLORS...absolutely NO problem for me whatsoever. I recently went through my box of ready-made cards and realized 90% of them are BRIGHT. Which fits my personality quite well since I'm kinda loud. hehe. I did throw in a little Pool Party (the teeny clouds) to tone it down a bit. Yeah....right. I freaking LOVE THIS STAMP SET (Up Up and Away). 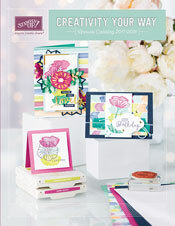 I totally SQUEEEE'd out loud when I saw it in our new Catalog! I've seen hot air balloons for real once in my life....Abilene had a hot air balloon festival when we happened to be up there visiting my Brother in Law and his family. It's so amazing to see them in action. And the crazy people who are willing to stand in that teeny, tiny basket and fly HIGH in the sky!!! I'll watch safely from the ground thankyouverymuch!!! Look at the TEENY TINY basket! GAH!!! I used markers to color some of the balloons, and popped up some of them with dimensionals. So...for the BLOG CANDY!!! I recently discovered I have ordered 2 different background stamps TWICE since our new catalog came out! That is how disorganized I am! (I also have flibbertigibbet tendencies...I know this. I also need an Organization Intervention in my Stamp Studio!!! GAH!!!) That also tells you how much I LOVE these particular stamps because I wanted to make sure I had them! BWAHAHAHAHA!! So I'm going to have back-to-back blog posts with blog candy! CAN YOU STAND IT!!! 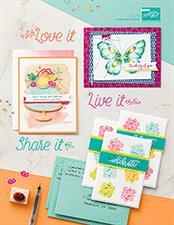 SO--to get your name in the hat for this week's stamp--the Stampin' Up! DISTRESSED DOTS background stamp--please leave a comment. You have until midnight CST, August 13th, 2011. I'll announce the winner on 8/14/2011! Good luck! Very cute card Dana! Love those balloons and the colors you used!! Super cute design! I don't need any stamps, but I did enjoy seeing the pictures. Didn't realize that was the only time you'd seen hot air balloons. It's an annual thing, y'all need to come up for it again some time. I LOVE HOT AIR BALLOON RACES! YES, I AM YELLING! I've been to several, and they are fabulous! I love it when all the trucks drive onto the field and they start filling them up. Then as soon as they're ready, they take off and wave to the crowd, then the trucks drive off as chase vehicles. LOVE LOVE LOVE it! LOVE LOVE LOVE that card!!! I think the colors are awesome!! I love it! I think hot air balloons are cool but I've never seen one in person. I think people who go up in them are a little nuts though! I LOVE your card!!! I love that set too, but it didn't make the cut this time :) When I lived in Phoenix we had a hot air balloon nearly land in our backyard! It was crazy! ohhh I wanna play! Seriously, though, I saw this stamp set and I, too, SQUEEEEE'd! This catalog is going to break my bank account, I'm afraid. HA! I love love love your card!!!! Nothing wrong with bright & colorful in my books! I love this set too but have not used mine yet (dang). Love the distressed dots background too and I don't have that one yet!!! I hope that I win. But then I already have because I have you as a freind.